Goldspeed Products backed racers recently wrapped up the 2014 WORCS season and did so in domineering style. David Flores took the overall in the competitive Pro-Am class and Pro class racer Dillon Zimmerman made a triumphant return after missing several rounds due to injury with a season best second place finish. After a frustrating crash that resulted in torn ligaments in his elbow, Goldspeed/JRiShocks racer Dillon Zimmerman was sidelined for what appeared to be the remainder of the 2014 season. After almost three months of rest, Zimmerman was given the green light from doctors to compete at the series finale in Primm, Nevada. The time off proved beneficial for Zimmerman as he was able to secure his best finish of the season. Coming off the line in 5th, Zimmerman managed to pick up one position before leaving the offroad truck portion of the track despite heavy pressure from Josh Row. 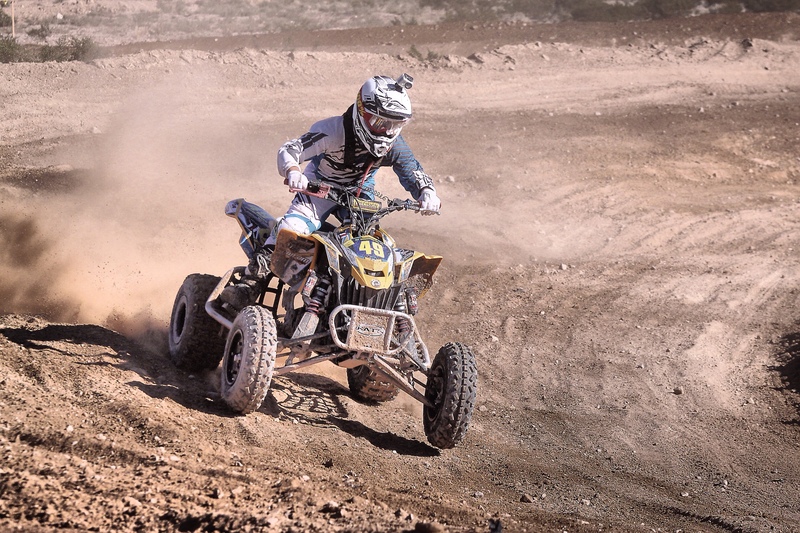 Holding his position, Zimmerman would eventually pass Robbie Mitchel to take over third place as the pair entered one of the many whoop sections on the brutal Primm course. 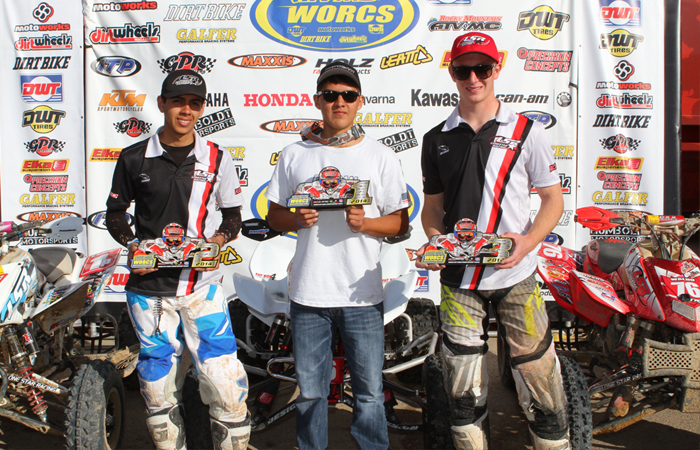 (2/16/2014) Round two of WORCS racing brought another successful weekend of first place and podium finishes for a host of Goldspeed backed ATV racers. Saturdays Production A race was a replay from round one with Goldspeed’s David Flores and Chandler Waxman taking the top two spots. Flores is defending his title in Production A and both riders are contesting for their first ever Pro-Am championship in Sunday’s main event. Mike Sloan and Cody Mitchell put Goldspeed wheels on the top two podium spots in Open A as well. Coming off of a 3rd place finish in Taft, Can-Am/Goldspeed racer Dillon Zimmerman was eager to prove that he’s a threat for the podium this year. Zimmerman looked solid throughout the race, fighting his way back from a 4th place start and taking over the 2nd place position on lap seven. For the next three laps, the Goldspeed/JRi Shocks racer put his head down and managed to make up time on the leader every lap. Unfortunately, on lap 10, Zimmerman noticed his left front wheel beginning to wobble. To avoid crashing he was forced to back off in hopes of making it to the pits but the wheel eventually fell completely off, ending his day and chances for a win. Primm, NV – At round two of the 2014 WORCS Series, Pro Motorsports’ Matt Hancock had a very successful weekend in his SxS and on his ATV. With a second place finish in the UTV 1000 Class and a podium finish in the Open A class followed by a sixth place in Pro-Am Class, Hancock was satisfied with his impressive finishes and is looking forward to moving on to round three. Here we go with 6.68 miles of new track. The moto track has been updated and we have added a good bit of length and more fun jump to the moto area.